A couple of days ago, I made my way to Seattle with a friend to join in the celebration of the Seattle Seahawks victory parade after the Super Bowl. In excess of what was anticipated, over 700,000 people crammed into about a 3-mile space to greet the returning heroes. It was an amazing scene. People ditched work, school, and other obligations to spend the day celebrating as a region. One of the remarkable things was that in all the turmoil of transportation woes, and other “challenges,” there wasn’t one arrest made. Talk about a peaceful party! (See photo you see is looking up from 4th Avenue to 5th Avenue. Believe it or not, there is supposed to be an actual road there. 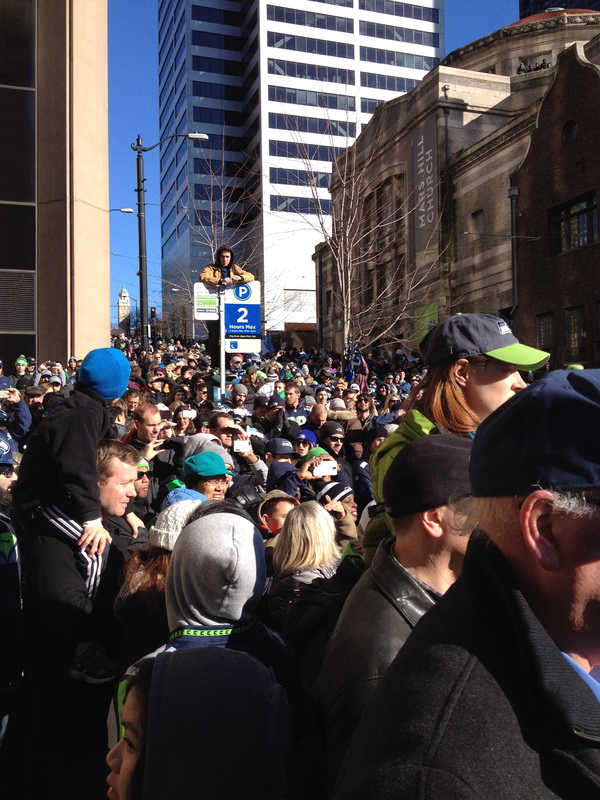 The street is packed with people for a block up and down. This was consistent with every block in the 3-mile route). How do you draw interest to your work, to your company, to the services and products that you offer? The Seahawks are an object of interest for many reasons. They are champions of the NFL, which is this nation’s national sport (drawing a record 110 million viewers). They have unique characters on the team that turn them from a “vanilla”to a “tootie fruity” brand of team. Their style of play appeals to most fans. And they have a coach that is emotionally charged and is romping up and down the sideline like he’s coaching a JV football team (which in and of itself is refreshing). What do you do that makes you or your company an object of interest? Do you write books on your expertise? Are you a dynamic speaker? Are you cited in interviews and publications? Do you write fascinating blogs, articles, E-books, or columns? Do you offer contrarian viewpoints rather than be part of the noise? What do you do to offer instant value to people and organizations? People flock to interesting people, teams, bands, and politicians. They also flock to those that aren’t “vanilla;” that are provoking and humorous; and that challenge and influence. If that doesn’t sound lie you yet, what are you waiting for? You offer important questions and keen insight into leadership. AND you have a very charming writing style that makes the reader actually WANT to read the ENTIRE column….rare indeed.